Last Thursday, I had the opportunity to attend TWTRCON SF 2010, much due in part to Anne Weiskopf, Dean Elmore and Kat Cornetta (thank you!) I’d like to share with you some takeaways I gathered from some of the great sessions I attended during the one-day conference. Please feel free to reach out to me in person if you’d like to talk more about these notes, or better yet, visit the blogs and websites of the speakers noted below — they have some very valuable knowledge to share. –	Four keys to social media success: Listen, Learn, Care, Serve. –	What does Twitter disrupt? Attention. Traditional media distribution channels. Human isolation. –	The most important thing to remember when using Twitter: Be helpful, even if this means sharing content that isn’t your own. –	Advertisers have moved beyond “WHY Twitter” and are now focused on “HOW.” 50 advertisers contracted currently with a goal of 140. –	On wrangling the firehose of data from Twitter: Working on a platform to allow third-party developer partners to more easily perform analysis for Twitter’s ad clients. 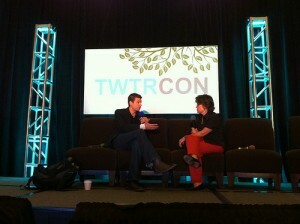 –	Adam’s suggestions on using Twitter for your brand: Be polite, delight, be newsworthy and relevant. –	Deciding on the message first, then figuring out, can Twitter help us? Can other tools help? –	Arrow has changed over the past 5 years into much more of a two-way conversation, rather than just shouting. –	The world of marketing has changed even more – Social web revolution, back and forth and side-to-side (btwn. customers) – we’re not even present/in control of this part. THIS is the new marketing – customer to customer. It’s going on without us. If you don’t understand this, your business will die. –	Don’t get hung up on # of followers. Justin Bieber has millions of followers. Is his message more important than yours? Message amplification: # of RT’s per 1,000 followers. Conversation: What does your Twitter stream look like? @ replies? Providing value that might not be sourced from you – maybe even your competitors. Did what you shared add value to the world? Conversation Rate: # of replies sent/day against index of Twitter accounts (and #of replies received/day). Outbound msgs. vs. inbound msgs. Focus on the size of your second-level network. Your active readers/retweeters/regular interacters and THEIR network. Sentiment Analysis: Don’t get caught up in measuring the positive, negative & neutral. Tools are not sophisticated enough yet to understand sarcasm & other nuances. An agency can help you with this if you’re really concerned. Words surrounding mentions of you: What words do people use most before mentioning your name? What words do they use after? What do these words say about your brand? Are there opportunities here? –	In October, Twitter did 1 billion queries/day; Google did 88 billion. Twitter is not the biggest in the search game, but holding up as a contender for real-time. –	When Yahoo gets the Twitter firehose, it has to index it in 10 minutes or less to be effective. Only counts queries from actual human beings typing in queries. Weeds out bots, spammers & click fraud. –	How to SEO in real time? Create retweetable content. –	With rollout of new social channels for Ford Fiesta campaign, 6.2 million views on 600 videos, 40 million impressions on Twitter, and got the attention of a brand new demographic. –	The results prove it’s working: 83% of the customers reached by social media campaign for the new Ford Fiesta (including a fan-driven video creation campaign) were new to Ford.